Gabriella “Ella” Bachnika (nee Keresztes), age 93, of Oberlin, passed away peacefully at the Welcome Nursing Home on the afternoon of Friday April 5, 2019. Born in Romania on July 4, 1925, Ella had been a long-time resident of Oberlin. For more than four decades she oversaw the plant department at the Ben Franklin Store in Oberlin; affectionately known as the Plant Lady by patrons of the store, Ella retired in 2000. In her free time Mrs. Bachnika enjoyed a variety of hobbies and interests including flower arranging, gardening, bird watching, and crafting. In addition, she displayed a passion for pitting her luck against scratch-off lottery tickets. 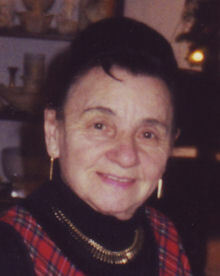 She is survived by her sister Eva Kramar of Elyria along with long-time friend and confidante Frieda Cassada of Oberlin. Ella also leaves nieces Pearl Novak, Shirley Beatty, Susan Henkel, Christine Henkel, and Lisa Gasier, nephews Anthony “Tony” Kramar and Charles Vegh, along with a host of great nieces and great nephews. She was preceded in death by her husband Rudolf Bachnika in 1994, parents Arpad and Ida (nee Bathory) Keresztes, sister Magda Vegh, and infant brother Loci. Ella’s family would like to extend their heartfelt gratitude to the staff at the Welcome Nursing Home and Mercy New Life Hospice for the kindness and care they exhibited during her residency with them. Visitation will be Tuesday April 16th from 10:00 a.m. until the time of funeral services at 11:00 a.m. in the Gluvna-Shimo-Hromada Funeral Chapel, 3224 Broadway Ave., Lorain. Reverend Peter Toth, pastor of the Hungarian Reformed Church of Lorain will officiate. Burial will follow in Brookdale Cemetery in Elyria. Heritage House of Oberlin - P.O. Box 455, Oberlin, OH 44074.